Bobber choppers are distinguished from regular choppers because their fenders have either been shortened or entirely removed. Bobbing (or removing) the fenders is one of the first things that a builder considers to make an ordinary bike look like a true chopper. Bobber choppers have a long and interesting history. 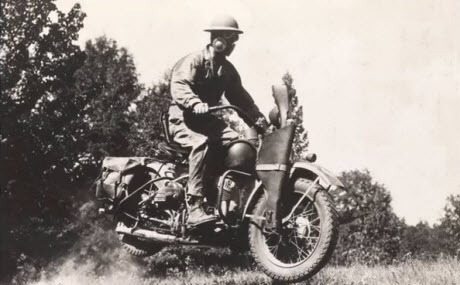 They were the brainchild's of soldiers who returned home from World War II who found that they had developed a taste for the more lightweight bikes that they had seen in Europe. 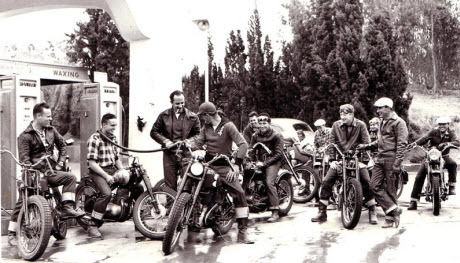 As war vets reunited after the war they began to form motorcycle clubs. They wanted faster, more nimble motorcycles so these clubs got very creative and started stripping down their bikes, which were often old military motorcycles, to make them lighter and faster. Image courtesy of Bob Maggil Photography. Before there was a chopper there was a bike simply called a bobber. Removing the fenders from motorcycles made them seem lighter and more European in style. 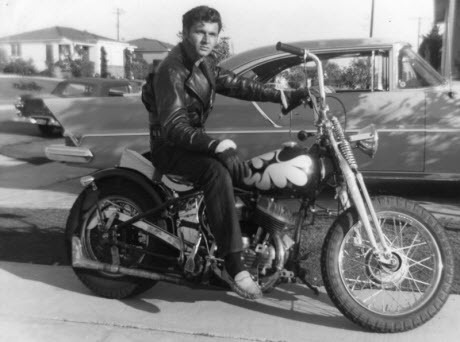 It wasn't until the early 60's and 70's that motorcycle enthusiasts started stripping away the rest of the bike. As sometimes the parts of the bike were literally chopped off to give the bike a lean sleek look they were nicknamed choppers. Many pop culture experts claim that the bikes that Peter Fonda, Jack Nicholson and Dennis Hopper rode in the movie Easy Rider paved the way for the evolution of bobbers to choppers in American society. 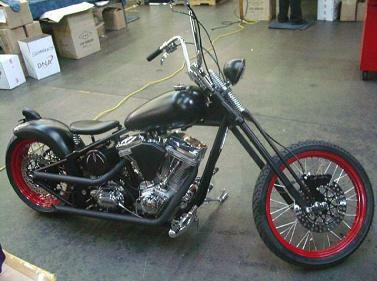 Like the bobber, the chopper was created by removing all but the absolutely necessary functional elements from the bike. This meant removing the windshield, headlights, crash bars, sissy bars as well as the front and rear fenders. Enthusiasts started raking the front end of the bike so to create a bike that had a pronounced rake, and lowering it to the ground. High handlebars called ape hangers were also added, front tires raised, gas engines shrunk or stretched, and huge glassy headlights were replaced by small focused high beams. As most bobber choppers did not have fenders anyway, it then became possible to fool with the size of the tires on the bike. Some of th most fashionable and sought after bobbers are the ones that sport a thin front wheel and a very fat rear tire, although fat front and rear tires represent a more traditional bobber. In Biker Lingo, choppers that sport extremely chunky back tires are called Fat Bastards. Handlebars were raised high and called ape hangers. The front tire was made small and the rear tire was made fat. Anything deemed to be unnecessary was removed. This made for a bike style that was unique and tailored to the rider since each rider decided just what needed to be done to his bike to create the chopper he or she desired. The bobber chopper, in essence, became a unique expression of ones self. Usually the backyard mechanic's first move was to create a bopper chopper by removing the front and rear fenders. As usual, the source of the genius behind the unique look of a bobber as we know today was the amateur mechanic. Since the day of World War II, building bopper choppers has become a very fine art that is practiced by talented commercial designers and professional mechanics who sell them for a pretty penny. Here is the best book on Bobber Choppers that is available. Upload A Picture Of Your Bobber And Describe It! 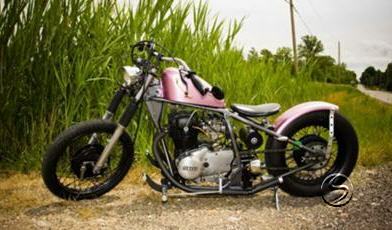 Simply upload a picture of your bobber and tell us the details. The more the better! We might put you in a slideshow movie that tens of thousands of people will see! Royal Enfield Bullet 500 Rat Bobber! Hardtail from voodoo vintage. Around 40 lbs removed. 1mm over bore making it around 700cc. Front tire from gs550 rear from xs650.